Enter the world of a battled tested warrior! In ancient tales knights bravely fought against overwhelming odds to ensure justice, defeat evil, and save their beloved lady. Create this warrior, clad in his armor, with Gouache. 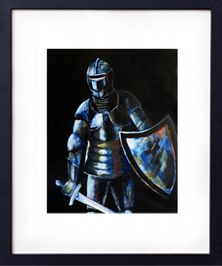 Gouache allows an artist to create the transparent metal sheen, while including the wear and tear of a suit of armor the knight would undergo as he courageously stands his ground in the heat of battle. Upon completing this project you will better understand the basics of drawing the human body and incorporating Gouache to create a masterpiece level project of your own!